This article rediscovers two rightly popular Impressionist painters, but draws a complete blank on a third, whose paintings and records may have been lost in the First World War. He initially trained as an engraver, then entered the studio of Léon Cogniet (1794-1880), a history and portrait painter in Paris who was a prolific teacher. His paintings were accepted for the Salon in 1846, and 1868-70, although his work was shown in the Salon des Refusés in 1863. In 1862, when Monet became very ill in Algiers, he provided support and helped him return to painting. From 1871, he divided his time between Paris, and painting around Honfleur, where he developed his Impressionist style and met with Boudin, Jongkind, and the Impressionists. Although one of the older artists in the group, he was very enthusiastic about the movement, and encouraged its younger members. He also showed works in the Third Impressionist Exhibition in 1877, and the Fourth in 1878. His paintings were collected by his patron, Count Armand Doria of the Château d’Orrouy in Picardy, whom he visited, with Colin, Manet, and Corot. He was sufficiently popular in 1900 for Georges Petit Galleries to publish his biography by Arsène Alexandre, which is freely available at Archive.org. 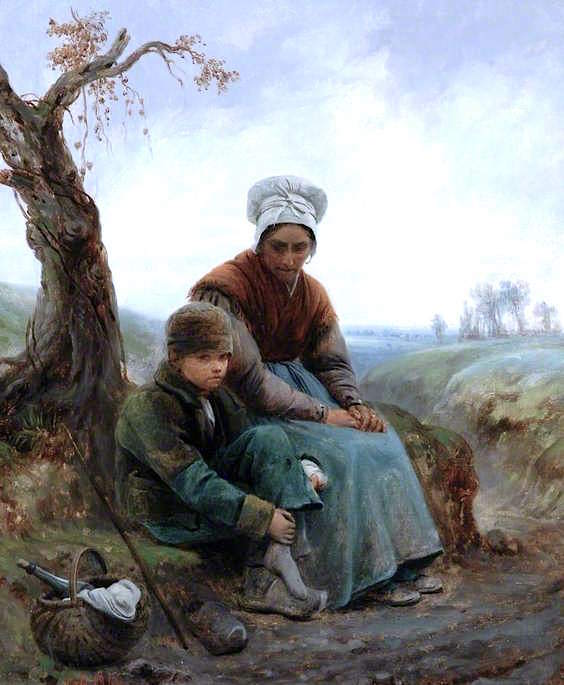 Adolphe-Félix Cals (1810–1880), Peasant Woman and Child (1846), oil on canvas, 46.4 x 37.8 cm, Barnard Castle, Teesdale, County Durham, England. The Athenaeum. Possibly his painting accepted for the Salon in that year, Peasant Woman and Child (1846) appears influenced by Millet, with its realistic depiction of rural squalor, and the telling wine bottle in the basket. 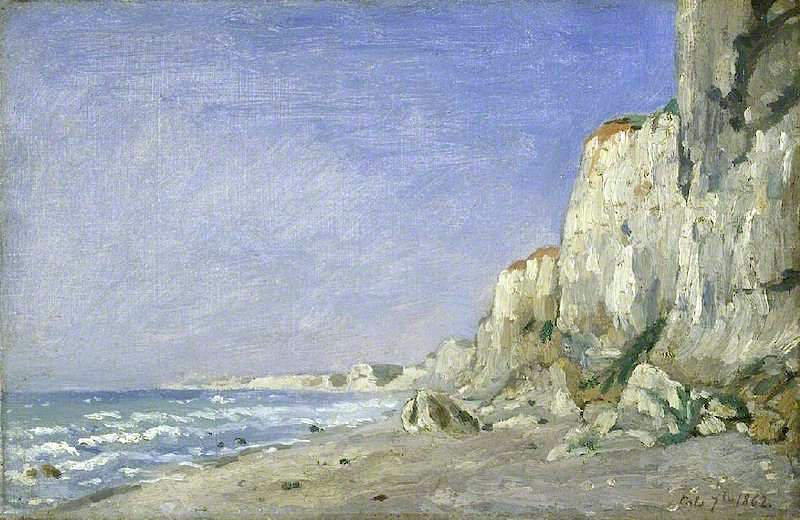 Adolphe-Félix Cals (1810–1880), Cliffs near Dieppe (1862), oil on canvas, 20.7 x 31.7 cm, The Fitzwilliam Museum, Cambridge. The Athenaeum. 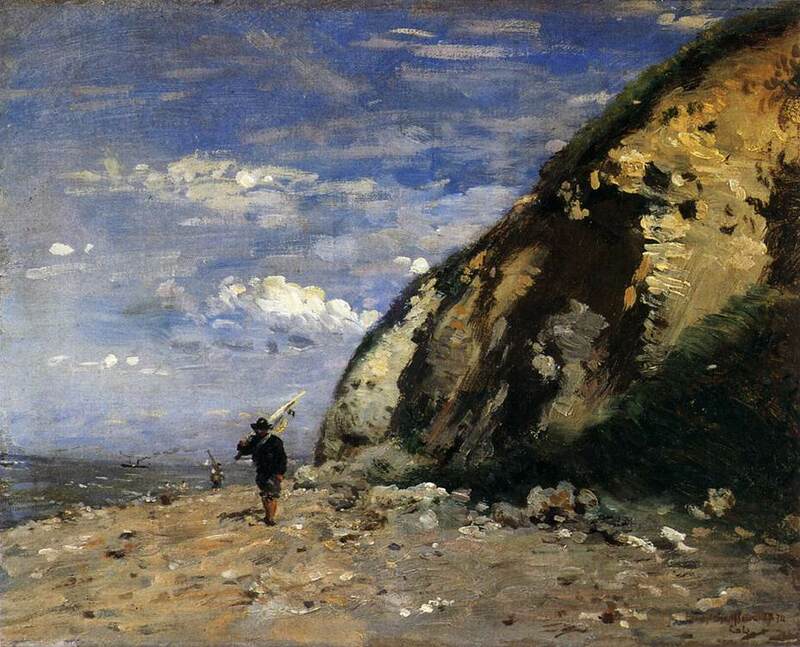 His Cliffs near Dieppe (1862) shows the radical change which early Impressionism brought, presumably with the influence of Boudin, Jongkind, and Monet. 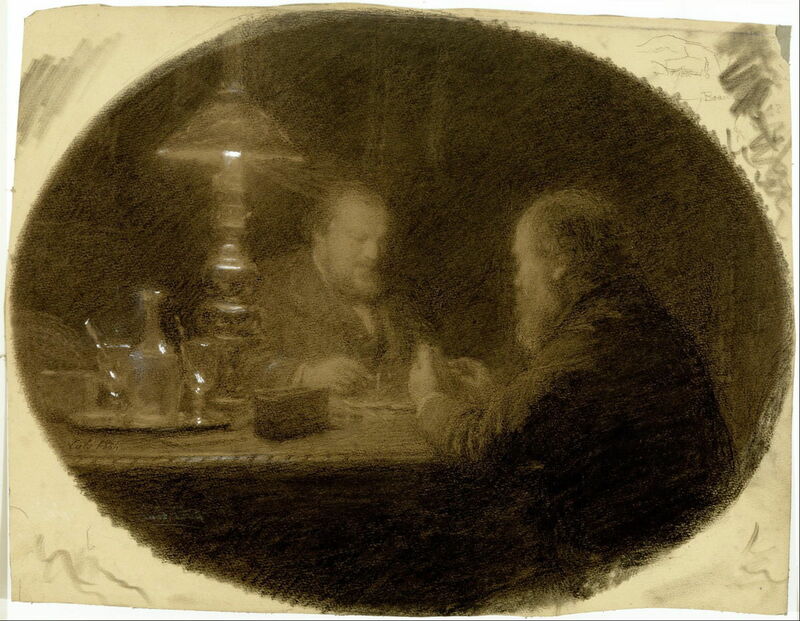 Adolphe-Félix Cals (1810–1880), Two Friends Around a Table (1864), black chalk heightened with white, 42.6 × 33.1 cm, Museum of Fine Arts, Houston, TX. Wikimedia Commons. 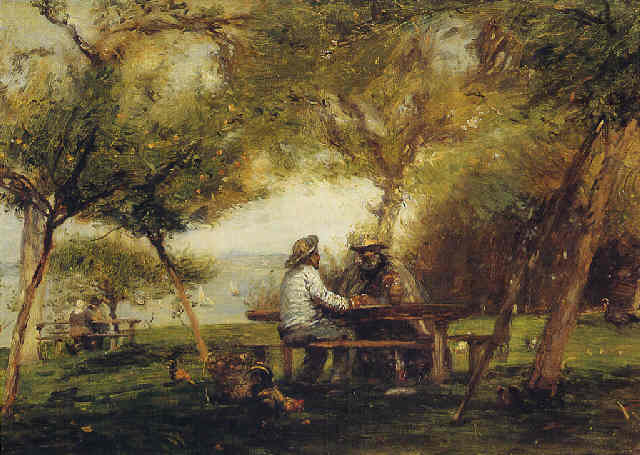 Two Friends Around a Table (1864) is a wonderful chalk sketch which appears prescient of the much later drawings of Seurat, with atmospheric highlights added. 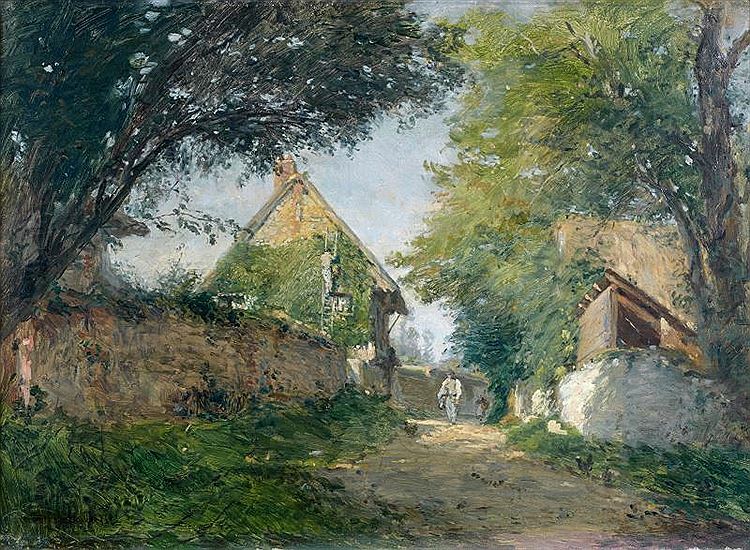 Adolphe-Félix Cals (1810–1880), The Well in Rue Montlaville, Orrouy, Viewed from the East (1866), oil on canvas laid on panel. 14 x 18.6 cm, The Fitzwilliam Museum, Cambridge. The Athenaeum. 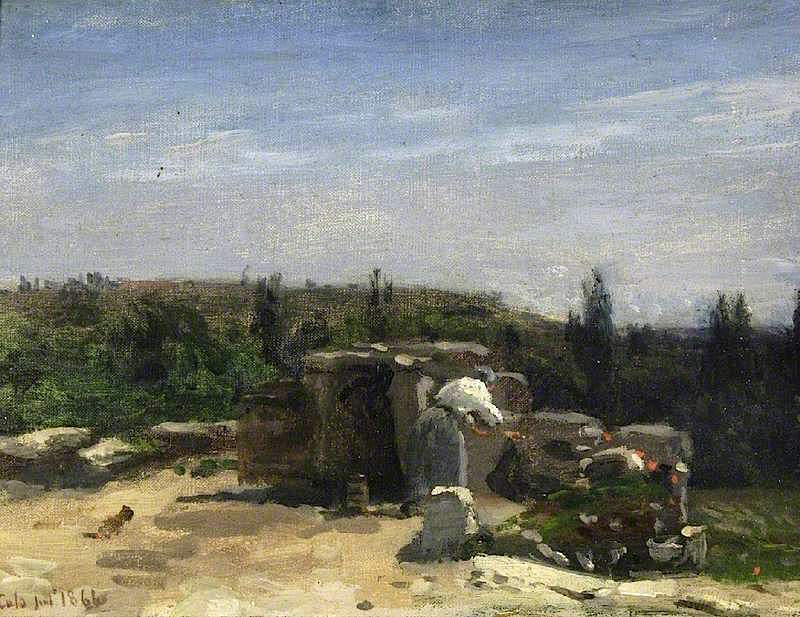 One of a pair of paintings of the same location, The Well in Rue Montlaville, Orrouy, Viewed from the East (1866) is a plein air oil sketch which shows the influence of Corot. Count Doria, his patron, had his estate here, at Orrouy, to the north of Paris. Adolphe-Félix Cals (1810–1880), Fisherman (1874), oil on canvas, 25 x 31 cm, Musée Eugène-Boudin de Honfleur, Honfleur, France. Photo © RMN-Grand Palais (musée d’Orsay) / Jean-Pierre Lagiewski. His Fisherman (1874) was almost certainly shown at the First Impressionist Exhibition, and appears to be another view of sea cliffs on the north French coast near Honfleur. Adolphe-Félix Cals (1810–1880), Landscape with a Farmyard (date not known), oil on panel, 24.6 x 32.5 cm, The Ashmolean Museum, Oxford. The Athenaeum. Landscape with a Farmyard (date not known) was probably painted at or near Saint-Siméon, the farm near Honfleur which became the focus of many Impressionist painters, and the subject of many of Cals’ paintings after 1871. Adolphe-Félix Cals (1810–1880), Saint-Siméon or The Big Farm at Honfleur (1876), oil on canvas, 35 x 54 cm, Musée des Beaux-Arts de Caen, Caen, France. Wikimedia Commons. 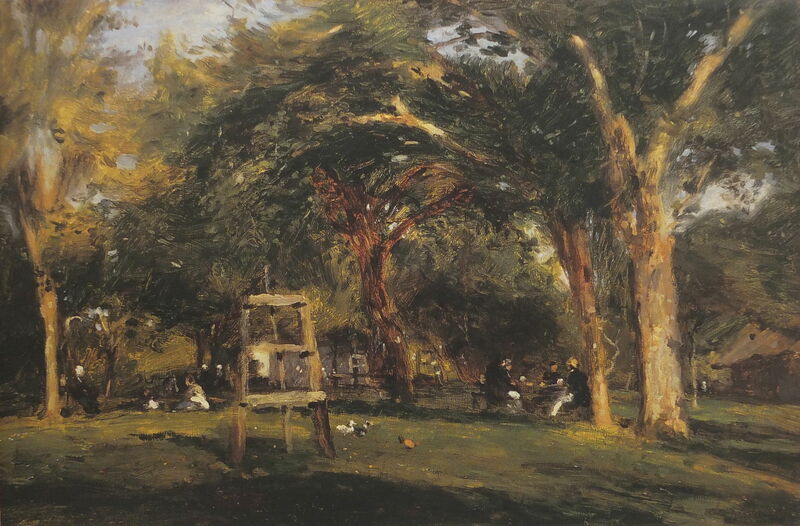 In Saint-Siméon or The Big Farm at Honfleur (1876), he shows an empty easel set up in the orchard at the farm, with several figures scattered around. His plainly visible brushstrokes appear to be organising themselves, much as Vincent van Gogh’s did nearly twenty years later. Adolphe-Félix Cals (1810–1880), A Sunday in Saint-Siméon (1876), oil on canvas, 60 x 120 cm, Private collection. Wikimedia Commons. A Sunday in Saint-Siméon (1876) shows another view of Saint-Siméon’s orchards. Honfleur Alley (1877) also has passages rich with swirling brushstrokes, but sacrifices none of its details for its painterliness. Surely this work alone should be shown among the major Impressionist landscapes, alongside those of Pissarro, Monet, and Sisley? Adolphe-Félix Cals (1810–1880), Sailors in Saint-Siméon (1877), oil on canvas, 42 x 58 cm, Private collection. Wikimedia Commons. 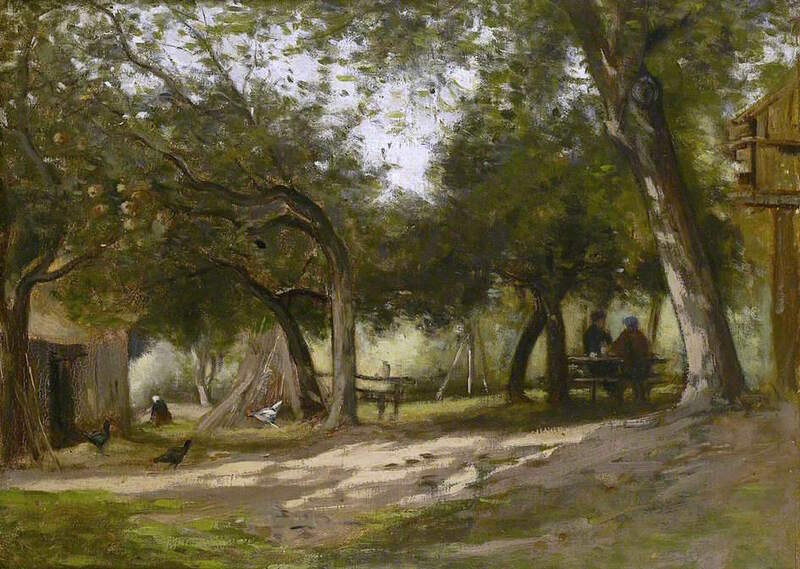 In his Sailors in Saint-Siméon (1877) the fruit trees show the influence of Corot. Born in Arras, near Calais on the north coast of France, he trained locally with Constant Dutilleux, then with Ary Scheffer and Thomas Couture in Paris, but was greatly influenced by Corot. He was first successful in the Salon in 1857, following which he set his studio up near Biarritz, at the southern, Basque end of the coast of the Bay of Biscay. There he painted landscapes en plein air, particularly coastal scenes. 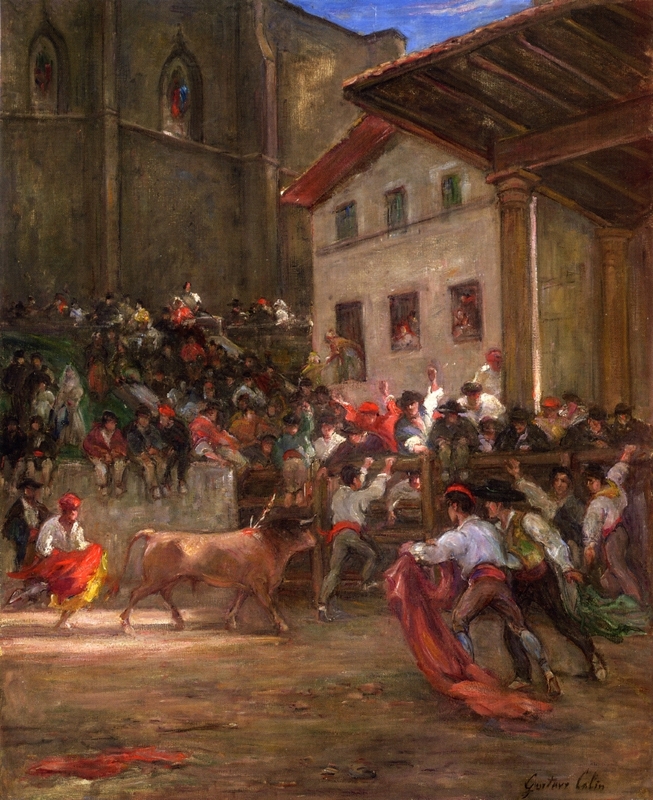 He also painted genre scenes of local sports including pelota and bullfighting. He met Whistler in 1862. In 1863, his work was included in the Salon des Refusés. His paintings were collected by his patron, Count Doria of the Château d’Orrouy in Picardy, whom he visited, with Cals, Manet, and Corot. 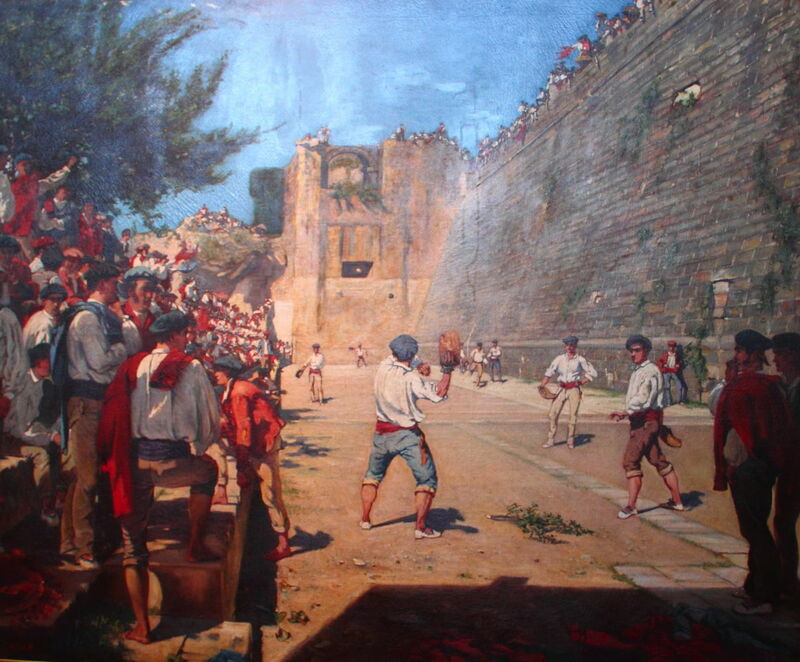 Gustave Colin (1828–1910), A Game of Pelota under the Walls of Hondarribia (1863), oil on canvas, further details not known. Wikimedia Commons. 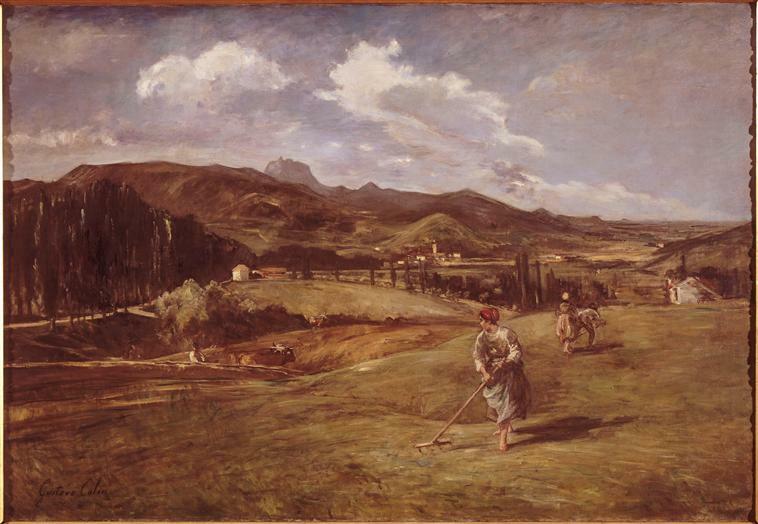 Many of Colin’s landscapes and other paintings showed the Basque region on the border between France and Spain, including his A Game of Pelota under the Walls of Hondarribia (1863). The game shown appears to be the traditional team version of Basque pelota, and this work, though bright and colourful, remains quite realist in its style. Hondarribia is a coastal town just inside the Spanish border. Gustave Colin (1828–1910), The Picador with the Bull (date not known), oil on canvas, 99.7 x 81.3 cm, Private collection. The Athenaeum. Probably painted at about the same time, The Picador with the Bull (date not known) has looser brushwork and a more Impressionist look to it. Gustave Colin (1828–1910), Basque Country (date not known), oil on canvas, 152 x 220 cm, Lycée Jeanson de Sailly, Paris. Photo © RMN-Grand Palais / Jacques L’Hoir / Jean Popovitch. His more traditional Basque Country (date not known) shows a rather idyllic view of farming and rural life at the time, Pissarro rather than Millet in its treatment. 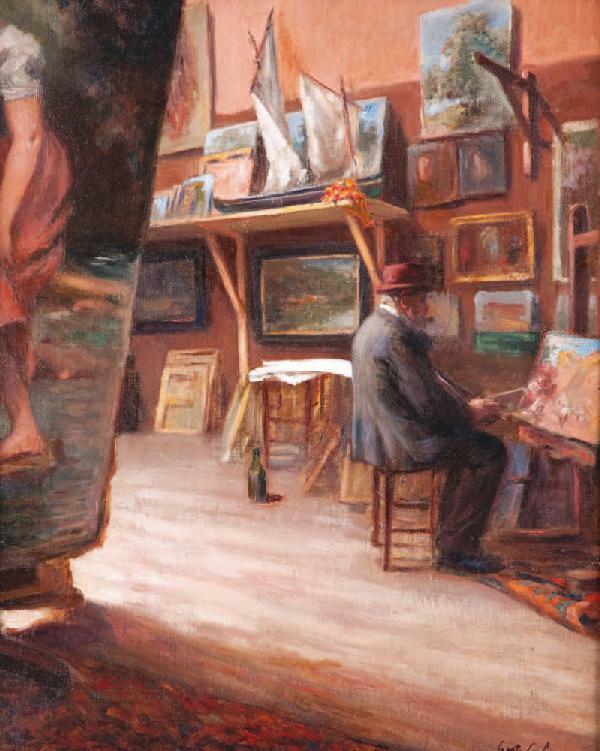 Judging from his appearance in his The Painter in his Studio (date not known), this was painted after the First Impressionist Exhibition. Gustave Colin (1828–1910), The Garden House (1894), oil on canvas, 33 x 40 cm, Private collection. The Athenaeum. 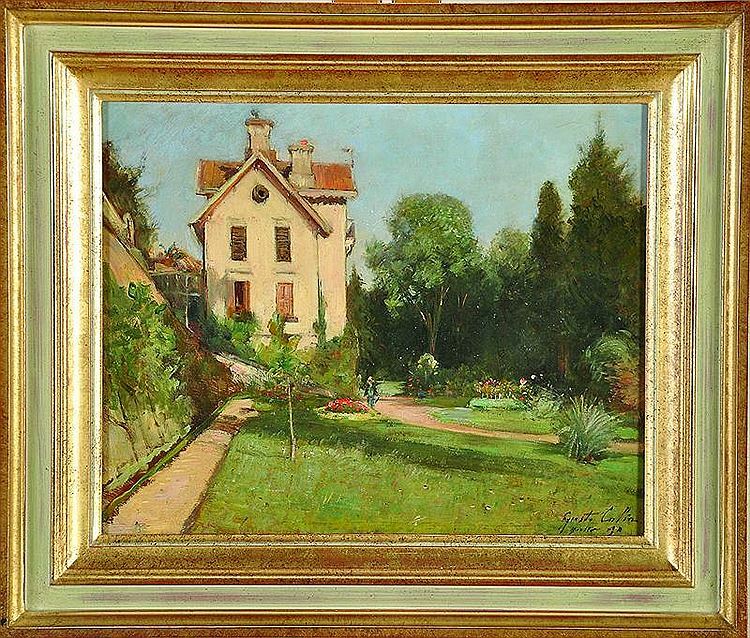 The Garden House (1894) is a late work which suggests that his style did not change much from his mature works. Posted in General, Painting and tagged Cals, Colin, Debras, exhibition, Impressionism, landscape, painting, unknown, vanished. Bookmark the permalink.